Did you know that 32% of pregnant women experience pelvic girdle pain, otherwise known as symphysis pubis dysfunction? I didn’t even know such a thing existed until I was pregnant with my first daughter, and lucky me, I am experiencing it this time around too, only it came on quite a bit sooner than last time. At 28 weeks, the excruciating pain from sudden movements, rolling over in bed, or even getting out of the car started. Anytime you have to spread your legs to move, you will feel this pain, and it is not pleasant, especially when you’re in bed sleeping and you’re already uncomfortable from the pressure of everything that’s going on in your growing belly. So… what is Symphysis Pubis Dysfunction? It’s a hormonal disorder where the body produces a hormone called “relaxin” in excess amounts. This causes loosening of the joints which leads to a lot of pain in the pelvic region. The pain mainly occurs when bones and ligaments stretch and move externally. Good for relieving cramps or pain from just about anything. I’ve been taking baths religiously every day. I just wished my 2nd bathroom had a soaker tub in it which is ideal for pregnancy. Those standard grade tubs that are in most houses are just not up to par for giant people, let alone pregnant people. I am 5’11” BTW. Now, you don’t want hot tub hot. There’s a reason there are warning signs listed for hot tubs. Let’s just say, if you’re sweating from the water being too hot, your body temperature is too high, which can lead to birth defects and even miscarriage. I needed support for the woes of the 3rd trimester. Something that would help me sleep better at night since I have been getting hip pain as well from sleeping on my sides and carrying this big belly around. I am normally a side sleeper and an occasional back sleeper. And since you’re not supposed to sleep on your back in the third trimester as it constricts blood flow, side it is. Boppy’s Multi-Use Full Body Pillow has been a lifesaver for relieving some pressure and pain. I love the shape of this full body pillow as it contours to your body and provides a little bit of elevation and comfort for your knees and legs. With this pillow, I am not tossing and turning so much since it takes some of the hip pressure off. It doesn’t support the bump as much as I had hoped for, but that’s okay because the Boppy Pregnancy Wedge Pillow is perfect for just that! If you do need to rotate, keep the pillow or wedge locked between your legs and roll over to your other side using your arms. It may seem hard at first, but it literally keeps the pelvic pain at bay since you’re not trying to use your pelvic muscles to rotate. The only downside to the Full Body Pillow is that it’s big. So if you don’t have a king sized bed, your partner may get annoyed that it takes up so much room. But, happy pregnant wife, happy life, right? The wedge is perfect to use with the Full Body Pillow since you can put the wedge in the front of your belly or down by your lower back for hip and back support. I honestly use the wedge more since it takes up less room (have a toddler in bed with us) and it takes the pressure off. If you’re wobbling around like a Thanksgiving Day Turkey, you need a maternity pelvic support belt pronto! It takes the majority of pressure off of your hips and pelvis and allows you to walk without as much of a hassle. They’re also comfortable, as long as you’re putting it on over your shirt/pants, otherwise, they can get pretty scratchy on the bare skin. I recommend wearing a tank underneath a top if you don’t want it showing. If you can handle someone touching you, go get a massage from a licensed practitioner who knows how to handle the body while pregnant. My sister just went and did this a couple of weeks ago since she is pregnant as well and she felt so much relief from it. You’re carrying around a big belly now, so you should probably stop carrying around heavy objects if you want to take the pressure off of your pelvis, hips, and back. I know it’s difficult for me since my daughter who is 36 pounds wants to be carried by mama still. Sometimes, you just need to say no and or have daddy do it. Hope these tips help you as much as they have helped me. This article is so beneficial for all the expecting mothers.. nice job! 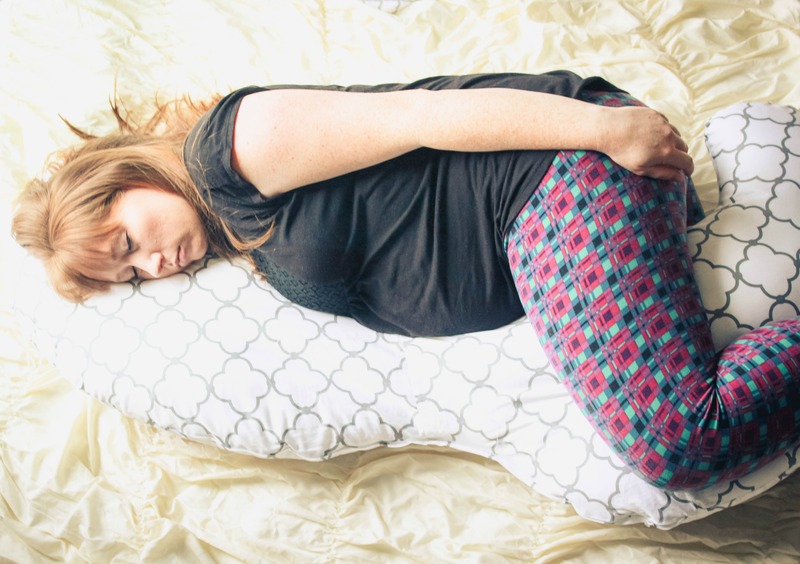 The pillow seems really in shape with the woman’s body during pregnancy. I love the creativity and the design of the pillow. Not pregnant, but know a couple people that are, so these are good things that I can recommend to my friends. This is such a good topic, because not many women know that pelvic pain happens and how to handle it. This is such a great read for expectant mothers. the pillow really seems helpful in supporting the body during the pregnancy and i think that is amazing. Wow, I didn’t know the Boppy Multi-Use Full Body Pillow will ease the pain. What a great news for the mom to be! I needed to tell more of my friends and cousins who are now pregnant and constantly complaining about their pain and had a hard time when sleeping. I have heard that a pregnancy pillow was so helpful for an expecting mother. These are all helpful tips for new mothers. I can sympathise with any pregnant mum who has this problem. I did too and in fact I still sleep with a pillow under my knee now and my youngest is 6! This is very helpful! Great for future moms out there! I wish I had someone to share these valuable tips with me when I was pregnant. You have absolutely wonderful ideas and tips for any Mama to be. This is so informative post. You have explained it in so much detail, it will be helpful for any expectant mother to know the symptoms and what actions can be taken. Boppy Multi-Use Full Body Pillow sounds great at easing the pain and symptoms. WOW that cushion looks and sounds amazingly helpful and comfortable. Will bear this in mind should the time come! Although I’ve never had children, I have such great appreciation for ago moms and what they have to ensure. These are important tips that will be so helpful for mommys to be! Thanks for the heads up! I’m hoping to get pregnant in the next two years and man there are so many changes and things to anticipate! I don’t remember experiencing this during pregnancy but then again I was pregnant a LOONNGGGG time ago (my kid will be 21 in a week). Glad the boppy is helpful in keeping the pain away. Pregnancy or not, a full body pillow is just what I need. Thanks for the information about the hormones as well, I never thought the name “relaxin” would be something bad for us. You gave pregnant women some really great tips here. I think everyone needs a full body pillow in their life for sure. I love that more and more people are being open about their pelvic pain and they’re finding ways to deal with it! Such a helpful article for expecting mothers. In my two pregnancies with my kids, I have not experienced it. But I heard from my friends it’s ubiquitous, and surely your post helps many.